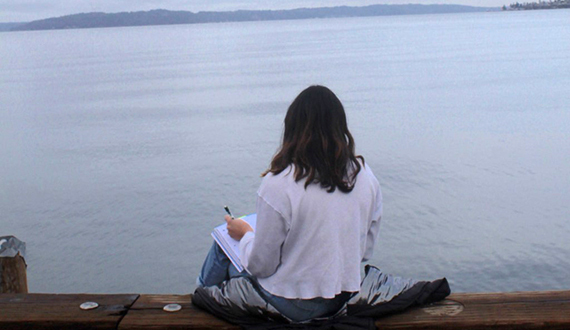 The first-ever Tacoma Ocean Fest Youth Story Contest invited youth to write about what the ocean means to them. At first, Grace was reluctant. She was on the verge of flunking school through poor attendance. But when Kathleen Figetakis, literacy chair at Tacoma Sunrise Rotary, Washington, USA, asked the Tacoma senior for one little favor – to put up posters in her school for the Tacoma Ocean Fest Youth Story Contest – Grace agreed. Six months later, she had not only won second prize in the contest, but she also graduated from high school – and helped the inaugural contest to be a wave of success. Tacoma Ocean Fest began on World Oceans Day, 2018. The brainchild of arts journalist Rosemary Ponnekanti, the festival celebrates arts, sciences and water fun. When Kathleen mentioned to Rosemary that her Rotary club was looking for youth literacy projects, an idea was born – to create a story contest around ocean awareness and conservation. Local teachers jumped on board. Some folded it into class curriculum, others encouraged students to attend the free poetry and film workshops held at the local library. Local teens were invited to write a poem, make a short film or – new this year – create a data graph about the ocean, its importance to them and the threats it faces, such as plastic pollution, climate change, and endangered orcas. And of course, there were incentives: prizes totaling $1,000 from Tacoma Sunrise Rotary, plus other donations and a free pizza coupon for every entrant, generously donated by Rotarian Lance Hungerford. The reaction at the festival, when students summoned their courage to read their poem or watch their film in front of a public audience, was overwhelming. “This was so powerful – that young people could speak their thoughts, passions and worries about our ocean’s future, and be heard by our community,” said city councilmember Ryan Mello, who presented the prizes. “I was blown away by their skill and commitment.” Finalists were also invited to read their poems at a Sunrise Rotary meeting, to warm acclaim. Now, the Tacoma Sunrise Rotarians are busy preparing for the 2019 contest. The most exciting change is three additional Rotary clubs are joining, including the Rotary Club of South Tacoma, Rotary 8, and Passport Club of Pierce County. Thanks to a partnership with Tacoma Public Schools, each school in disadvantaged areas will get a Rotarian volunteer to support teachers to create more success stories like Grace’s. Winners of the 2019 contest will be presented at Tacoma Ocean Fest on June 9. Learn more about Rotary’s programs for young leaders, including Rotaract, Interact, Rotary Youth Leadership Awards, and Rotary Youth Exchange, and how you can get involved in developing the next generation of leaders.